In some conditions (table 1), the child is abnormally short or tall from infancy onwards, whereas in others initial normal growth is followed by growth failure or acceleration. Individual measurements at a single point in time detect absolute short or tall stature but two or more measurements over a period of time are needed to detect a change in growth rate, irrespective of the starting height—hence the preferred term is “growth monitoring”, not “screening”. Nevertheless, growth monitoring is a form of screening—it involves offering a simple rapid test to apparently healthy people, to separate a group of subjects who are at high risk of having abnormal growth from a larger group who are at low risk. The classic requirements for screening programmes are well known (table 2). How well does growth monitoring perform? Growth curves for girls with Turner's syndrome superimposed on the 1990 nine centile height chart. The benefits for final height of early treatment with oestrogens and growth hormone are still controversial.12 13 However, short stature might be less distressing than the infertility, and it may be psychologically better for the girl to grow up knowing about this, rather than discovering it at puberty. Effective growth monitoring needs precise measurement, accurate plotting on appropriate charts, correct interpretation, and a plan of investigation for screen positive cases. Some endocrinologists prefer longitudinal charts,18 19 but the 1990 nine centile charts are recommended for general use20 21—they are well documented, are based on a large dataset, and show not only ± 2 SD lines but also ± 2.67 SD lines; only one child in 250 falls outside these limits. Separate charts for each ethnic group have been considered,22 but are neither practical nor desirable. The most simple approach is to treat each measurement as a single screening test, using the 0.4th centile as a cut off point for short stature. The shorter the child, the greater the probability of organic disease.29 At any age, a height measurement under the 0.4th centile, without previous explanation, would merit evaluation. In a cohort of 100 000 children, there might be up to 30 children with isolated GHD11 and perhaps 12 with Turner's syndrome who had not been diagnosed in the neonatal period. The yield of screening would be less than this, because some children would present clinically as a result of parental concern and some would be above the 0.4th centile in height. Although the yield would increase by using the 2nd centile as the cut off point, the price would be a fivefold increase (from 400 to 2000/100 000) in children needing evaluation. A small number of other previously unrecognised conditions in addition to GHD and Turner's syndrome would be identified by screening. The school health service is changing rapidly, but in many districts school entry (4–5 years) probably still offers the best single opportunity to identify previously undetected cases of GHD and Turner's syndrome, because almost 100% of children can be examined. The yield would be lower in younger children, because measurement is less precise and the degree of growth failure would be less. A second measurement a year or more after starting school, using the 0.4th centile cut off point, might identify a few of the children missed at age 5, but the yield would inevitably be very small. Criterion 7 (table 2) indicates the need for an agreed approach to investigation for “screen positive” individuals. Evaluation for most conditions listed in table 1 can be achieved by physical examination and straightforward low cost investigations, within the scope of a general or community paediatrician or an interested general practitioner.29 Unfortunately, for isolated GHD, the most important target disorder, there is no simple protocol defining how this diagnosis can best be excluded by the non-specialist, or when the expertise of a paediatric endocrinologist should be enlisted. Sensitivity of height measurement as a screening test could be improved by including children above the 0.4th centile who are short for parental height. Similarly, specificity could be increased by excluding children below the 0.4th centile whose parents are short. In practice, however, there are a number of difficulties. The height of both parents is not always available, although the height of one parent (or even a sibling) can be useful. Self reported heights and estimated heights of partners are not very reliable. Very short parents might themselves have a growth disorder. One small study found that 4% of normal height children and 40% of short/normal children were outside the expected range when corrected for parental height, whereas half of new cases with pathology were within the expected range (Mulligan J, Voss L, personal communication, 1999). A new screening chart (TJ Cole 1999, unpublished data) would screen in all children below the 0.4th centile and also those above the population 0.4th centile but below the 0.4th centile adjusted for parental or sibling height. This could improve sensitivity without significantly reducing specificity. Adjustment for regression to the mean can be included.30 These proposals have not yet been field tested and, at present, correction for parental height is still too complex a procedure for screening. Weight and height are traditionally assessed together and can be interpreted using a body mass index (BMI) chart.37Although the distribution of weights and BMIs corresponds reasonably closely to the 1990 charts at age 5, by age 12 the BMI distribution has changed significantly compared with the 1990 data, indicating a trend to increasing obesity over a very short timescale.38 The issue is undoubtedly important, but it is not clear what can be done to reverse this trend or tackle the problem at an individual level. The role of BMI charts in community practice needs further study,39 and “screening” for obesity would not currently fulfil accepted criteria. Recording height and weight together would have greater clinical and public health value than height alone. There are two considerations. First, both population trends in height and changes over time in the height differential between social classes are useful health and social indicators.40 Second, monitoring the changing weights and BMIs of the nation's children is important in view of the high and increasing prevalence of obesity, and could be facilitated by a policy of universal measurement when children start school. Single height measurements, with a cut off point at the 0.4th centile on the 1990 charts, come closest to satisfying the criteria for screening. School entry offers a good opportunity to screen the whole population. The theoretical advantages are low marginal cost when combined with other school entry screening procedures, potentially high coverage, an acceptable yield of new cases of isolated GHD and Turner's syndrome, secondary benefits in case finding for other disorders, and (when combined with weight) a contribution to a core dataset for child public health. Correction for parental height should not at present be undertaken as part of screening. Because the school entry measurement offers the best opportunity to identify growth disorders, the measurement must be done to a high standard, so reliable equipment must be supplied and correctly assembled or installed, and staff training is essential. Quality and in particular measurement error must be monitored. Lack of a validated protocol for the management of children below the 0.4th centile is an important obstacle to an effective screening programme. Children whose height is above the 99.6th centile need be referred only if there are other unexplained symptoms or signs. Height measurement at other ages, using the 0.4th centile to trigger action, is good clinical practice. It should be undertaken on an opportunistic basis when a child is seen for other reasons, whether in primary or secondary care, but should not be regarded as a total population screening programme. Routine growth monitoring to detect centile crossing has too low a sensitivity and specificity to be regarded as screening. These conclusions will seem counterintuitive to many health professionals, but are supported by empirical and theoretical evidence. The next step is to determine whether it is possible to maintain staffing and standards for the school entry height screen, given the far reaching changes in school health services. Alternatively, the task might be incorporated into primary care—for example, the child could be measured and weighed at the same time as the preschool booster immunisation. Either way, it will be important to improve training for primary care staff in responding to parental concerns about growth and being aware of unusual paediatric disorders. This paper was much improved by comments from C Wright, T Cole, P Hindmarsh, J Wales, M Preece, L Voss, J Mulligan, S Hall, and T Fry. I am particularly indebted to B Bailey for help with the . The views expressed in this paper were supported by most but not all members of the Coventry meeting. The best measurement of the precision of height measurement is the standard deviation of a single height measurement (SDshm) which, for school age children, has a value around 0.2–0.3 cm. The 95% confidence interval for a child's height therefore extends about 0.5 cm (2 SDshm) on either side of the measured height so that, if a child's height is observed to be on the 3rd centile we can be very confident that the true height lies between the 2nd and the 4th centile. The interval width is similar for 3 year olds, but for 2 year olds it is double in size. So the 95% confidence limits of a 2 year old boy's height, measured at 79 cm, would be 78 cm (that is, on the 0.2 centile) and 80 cm (on the 1.2 centile). The 95% confidence limits to a single height velocity, measured over a full year by the same measurer on both occasions, lie +2(SDshm)2 cm/year about the measured velocity. For school age children, this works out at +0.71 cm/year. Consequently, a child whose measured velocity over the period 5 to 6 years falls on the 25th centile might have a true velocity between the 8th (worryingly slow) and the 50th (very satisfactory). These confidence limits would have to be doubled if two measurements were taken only six months apart. These calculations relate only to children randomly chosen from the population. 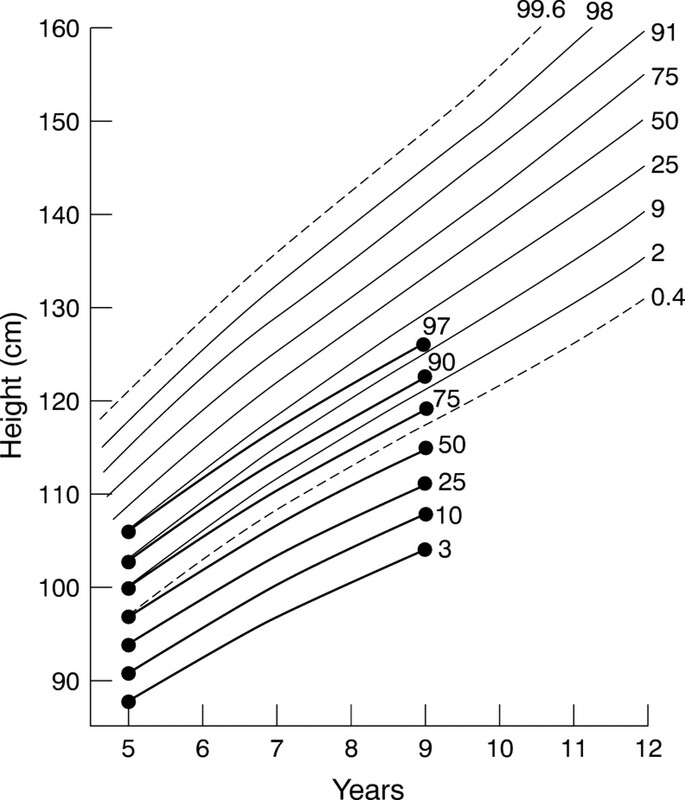 For such children, the correlation between annual height measurements increases with age, so that preschool children are more likely than schoolage children to cross centile bands. Centile crossing is also more likely with longer measurement intervals. If a child is measured a second time only because the first measurement gave cause for concern (for instance because the child was considered unusually short), any inference about that child's growth should take into account that the expected velocity is not the same for every child, but is conditional on the initial height. (1999) Growth monitoring in children (Cochrane review). The Cochrane library, issue 1. (Update Software, Oxford). (2000) Identification and management of failure to thrive: a community perspective. Arch Dis Child 82:5–9. (1986) When are we diagnosing growth hormone deficiency? Arch Dis Child 61:110–112. (1984) Growth hormone deficiency presenting under age 2 years. Arch Dis Child 59:557–560. (1988) Contribution of dose and frequency of administration to the therapeutic effect of growth hormone. Arch Dis Child 63:491–494. (1987) United Kingdom multicentre clinical trial of somatrem. Arch Dis Child 62:776–779. (1994) How are children's growth problems diagnosed? Child Care Health Dev 20:371–377. (1996) Screening for growth: towards 2000 [letter]. Arch Dis Child 74:183. (1985) Growth curve for girls with Turner syndrome. Arch Dis Child 60:932–935. (1998) The growth pattern and final height of girls with Turner syndrome with and without human growth hormone treatment. Pediatrics 101:663–668. (1994) Utah growth study: growth standards and the prevalence of growth hormone deficiency. J Pediatr 125:29–35. (1989) Growth hormone secretion in Turner's syndrome and influence of oxandrolone and ethinyl oestradiol. Arch Dis Child 64:587–592. (1999) Does treatment usefully increase final height in Turner syndrome? A multicentre audit of 475 adults [abstract]. Arch Dis Child 80 (suppl 1) A10. (1991) Short stature and school performance—the Wessex growth study. Acta Paediatr Scand Suppl 377:29–31. (1995) Short stature: does it matter? A review of the evidence. J Med Screen 2:130–132. (1997) Are short normal children at a disadvantage? The Wessex growth study. BMJ 314:97–100. (1997) Long term results of growth hormone treatment in France in children of short stature: population, register based study. BMJ 315:708–713. (1994) Growth charts for both cross-sectional and longitudinal data. Stat Med 13:2477–2492. (1997) Revision and update of Tanner-Whitehouse clinical longitudinal charts for height and weight. Eur J Pediatr 156:248–249. (1995) Cross sectional stature and weight reference curves for the UK, 1990. Arch Dis Child 73:17–24. (1999) Adequacy of standards for assessment of growth and nutritional status in infancy and early childhood. Arch Dis Child 80:121–124. (1994) Pre-school weights and heights of Europeans and five subgroups of Asians in Britain. Arch Dis Child 71:207–210. (1998) Growth monitoring: testing the new guidelines. Arch Dis Child 79:318–322. (1994) Height velocity screening: the real world. J Public Health Med 16:200–204. (1990) The reliability of height measurement (the Wessex growth study). Arch Dis Child 65:1340–1344. (1997) Diurnal variation in stature: is stretching the answer? Arch Dis Child 77:319–322. (1992) Measuring the heights of very young children. BMJ 304:1351–1352. (1994) Equipping the community to measure children's height: the reliability of portable instruments. Arch Dis Child 70:469–471. (1992) Poor growth in school entrants as an index of organic disease: the Wessex growth study. BMJ 305:1400–1402. (1999) The strengths and limitations of parental heights as a predictor of attained height. Arch Dis Child 81:257–260. (1994) Monitoring the heights of pre-pubertal children. Ann Hum Biol 21:1–11. (1991) The reliability of height and height velocity in the assessment of growth (the Wessex growth study). Arch Dis Child 66:833–837. (1995) Can we measure growth? J Med Screen 2:164–167. (1998) Normal growth in the short pre-pubertal child. J Med Screen 5:127–130. (1999) Validity of height velocity as a diagnostic criterion for idiopathic growth hormone deficiency and Turner syndrome. Horm Res 51:68–73. (1999) Changing practice in growth monitoring. BMJ 318:344–345. (1998) Body mass index standards for children. BMJ 317:1401–1402. (1999) Too short or too fat: should we be monitoring weight? Lancet 353:413–414. Mulligan J, Voss LD. Identifying very fat and very thin children. BMJ. [In press.]. (1993) Deprivation, low birth weight, and children's height: a comparison between rural and urban areas. BMJ 307:1458–1462. Reliable growth data does not require expensive equipment, just some care. If universally adopted, a standardised technique would increase precision and minimise interobserver bias. The method described here is evidence-based and was debated and accepted at Coventry. The degree of accuracy and precision required depends, ultimately, on how the data are to be used. There are two key questions to keep in mind: Is the reading accurate? The accuracy of the measurement depends on the correct installation and regular maintenance of the instruments used.Is the reading reproducible? The validity and thus the interpretation of growth data depends on the reproducibility or precision of the measurements. It is crucial to know whether the size of any increment observed over time is likely to be real and not owing to measurement error. Most errors arise from the careless reading and recording of data. They will not be obvious unless very large. Height is greatest on getting up in the morning—up to 2.0 cm can be lost over the whole day. Measurements made at different times of day can significantly affect the measured height and, thus, the estimated rate of growth. Subsequent measurements should be made at the same time of day, or at least in the afternoon, when the rate of height loss slows down. NB—Stretching is ineffective in preventing diurnal variation. Different observers, even apparently using the same technique, may record significantly different heights for a child. Ideally, a child should be monitored by the same observer using the same instrument, but this is not always feasible. An unstretched technique is therefore recommended, as it gives the same degree of intraobserver precision as a stretched method, but minimises interobserver bias resulting from different degrees of stretching. Where the previous height of the child is known, a further source of bias may be introduced. Measurements should be “blind”. Observers should not look at previous data and should not keep measuring until they get the reading they expect to see. Ideally, use a self calibrating stadiometer. It should be placed on a hard, uncarpeted surface, against a bare wall. Wall mounted instruments, if used, must be hung from a permanently fixed nail, not plastic putty. The accuracy of all instruments should be checked with a calibrated rule both before and after each session. Worn instruments should be replaced. Note time of day, instrument used, and name of measurer. Some allowance must be made in cases where child is knock kneed, or obese. With very young children, an assistant is required to ensure knees do not bend and heels remain down. Some practitioners like a weight on the headboard to counteract springy hair. If used, it should be used every time and recorded.